I have a question about the divergence theorem that has confused me for some time. This seems to be contradicted in the example for a telescoping series below. Here they say that goes to 1, and the series sum is one. But and as wnvl pointed out, . You are confusing with . ok, I think I see now. is the sequence of terms. The Nth them must be zero otherwise you will never stop adding to the series, and it will have to diverge. is the partial sum of the first n-terms. It is confusing because all we are doing is putting in a another form and saying now it's now zero it's one. So, by the theorem cited above, we know the infinite series is divergent if . 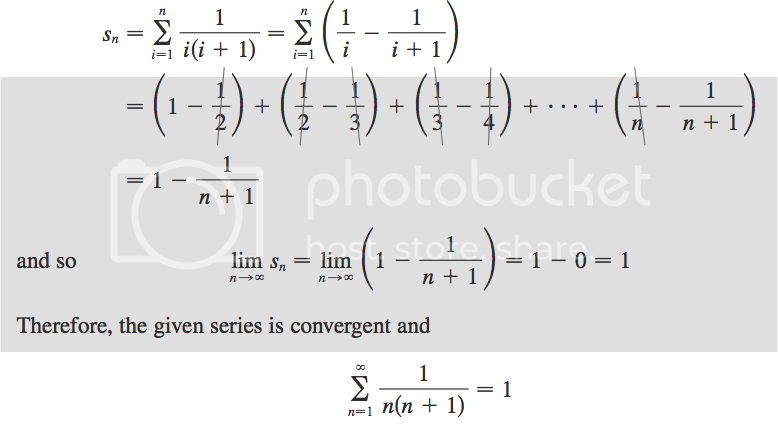 This does not mean necessarily however, that the infinite series converges if . Once we've established it diverges then we are done, but if the test for divergence fails, then we must prove whether it converges or not through the various tests for convergence.